Ross & Cromarty Roots | Donald & Margaret (McLean) McLennan & family. Donald & Margaret (McLean) McLennan & family. Erected/in memory of/JANET McLENNAN/died at Hawthorn Cottage/on 13th Nov. 1883/aged 8 years/ MURDO McLENNAN/died at Hawthorn Cottage/in infancy 6 Jan. 1886/and their parents/DONALD McLENNAN/died at Muir of Ord 18 Aug. 1918/aged 88 years/and MARGARET McLEAN/who died there 16 June 1918/aged 68 years/and their sons/RODERICK died at Sandypoint/S. America 2 Dec. 1896/aged 23 years/ALEXANDER died at Punta Arenas/S. America 5 June 1917/aged 45 years/JOHN died at Vancouver BC/21 July 1927 aged 43 years. Blessed are the dead/which die in the Lord. Picture Added on 11 March 2008. 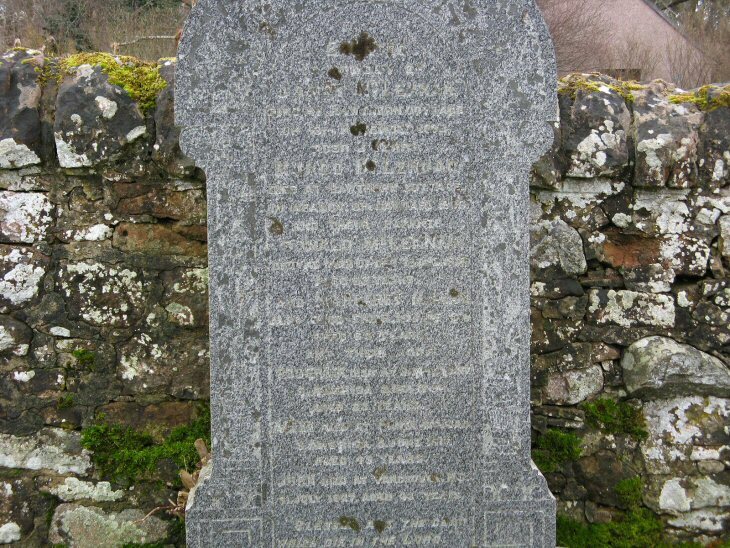 Browsing the internet here in Santiago, Chile, I'm amazed to find the gravestone of my great grandfathers back in Scotland. My best regards to any other descendants that might find this picture. Francisco. Added by Francisco Jackson on 07 November 2008.